…Whenever the Supreme Personality of Godhead descends in His human form, He sends ahead all His devotees, who act as His father, teacher and associates in many roles. Such personalities appear before the descent of the Supreme Personality of Godhead. Before the appearance of Lord Śrī Kṛṣṇa Caitanya Mahāprabhu, there appeared His devotees like Śrī Mādhavendra Purī; His spiritual master, Śrī Īśvara Purī; His mother, Śrīmatī Śacīdevī; His father, Śrī Jagannātha Miśra; and Śrī Advaita Ācārya. Advaita Ācārya having appeared, He found the world devoid of devotional service to Śrī Kṛṣṇa because people were engrossed in material affairs. Everyone was engaged in material enjoyment, whether sinfully or virtuously. No one was interested in the transcendental service of the Lord, which can give total relief from the repetition of birth and death. Seeing the activities of the world, the Ācārya felt compassion and began to ponder how He could act for the people’s benefit. [Advaita Ācārya thought:] “If Śrī Kṛṣṇa were to appear as an incarnation, He Himself could preach devotion by His personal example. 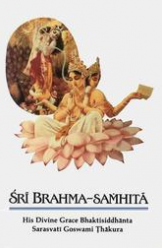 “In this Age of Kali there is no religion other than the chanting of the holy name of the Lord, but how in this age will the Lord appear as an incarnation? “I shall worship Kṛṣṇa in a purified state of mind. I shall constantly petition Him in humbleness. 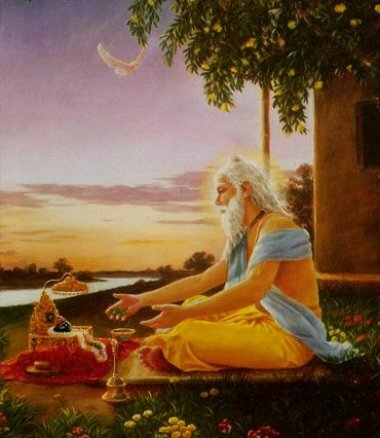 Thus the Lord liquidates the debt by offering Himself to the devotee. 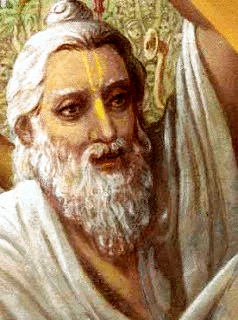 Considering this, the Ācārya began worshiping the Lord. Thinking of the lotus feet of Śrī Kṛṣṇa, He constantly offered tulasī buds in water from the Ganges. He appealed to Śrī Kṛṣṇa with loud calls and thus made it possible for Kṛṣṇa to appear. Therefore the principal reason for Śrī Caitanya’s descent is this appeal by Advaita Ācārya. 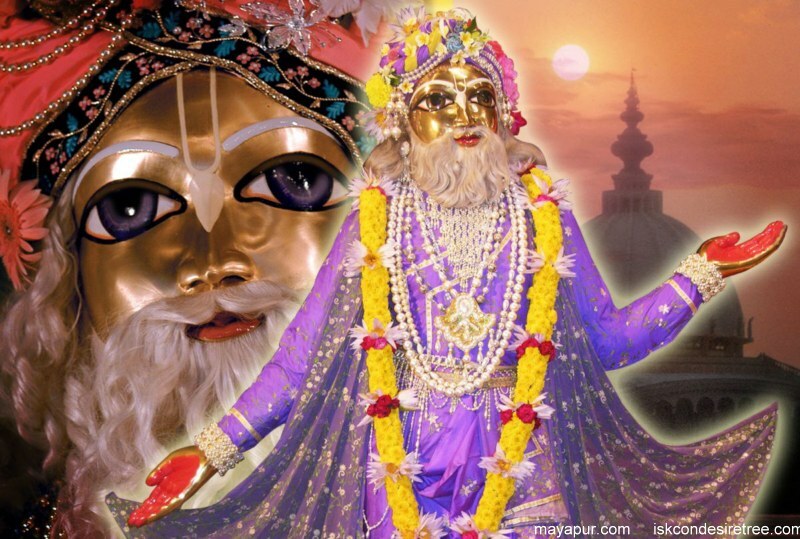 The Lord, the protector of religion, appears by the desire of His devotee. While most of the world celebrated the Appearance day of Advaita Acarya yesterday…according to the BBT Art Calendar the variant date for our area is today. (go figure?) So we are posting some verses from the Sri Caitanya-caritamrta in honor of His appearance. mahā-viṣṇuḥ—Mahā-Viṣṇu, the resting place of the efficient cause; jagat-kartā—the creator of the cosmic world; māyayā—by the illusory energy; yaḥ—who; sṛjati—creates; adaḥ—that universe; tasya—His; avatāraḥ—incarnation; eva—certainly; ayam—this; advaita-ācāryaḥ—of the name Advaita Ācārya; īśvaraḥ—the Supreme Lord, the resting place of the material cause.